A lot of people try taking notes, but give up: they are too long, they are not useful when reviewed later, they are too time-consuming to make, etc. In this article, I will try to explain how I take notes and still avoid these pitfalls, and share the notes I took for the purpose of my interview with Google with you. Following my other post about my Google interview process and how I studied for it, a lot of people have asked me via various channels about my note-taking routine and how I manage to take notes on so many different things in such a short period of time (as they put it; as for me, I think it is a completely normal pace). In this post, I will talk about the principles I follow when taking notes, as well as share my own notes on some of the subjects I have studied so far. There are already tons of articles out there explaining why taking notes improves memory retention (e.g. this PBS post) and why taking notes by hand is better than doing it on a laptop (e.g. this NPR article), so I am not going to go into that. Just suffice to say that taking notes improves memory retention for topics you read, and increases your comprehension rate as well as your comprehension depth, unlocking levels of subconscious understanding that are otherwise completely untapped. For even better retention, avoid orating what you are reading out loud. That significantly undermines your study abilities. It also annoys the heck out of whoever happens to be nearby. Increased tension is detrimental to your study outcome. What is it that we are trying to retain, though? We are going to review our notes to avoid the hassle of poring over the text again once we are done. Isn’t that right? So, is the note supposed to replace the textbook? No, in the sense that your notes are not going to help someone other than you learn the same material with the same depth without consulting the textbook. 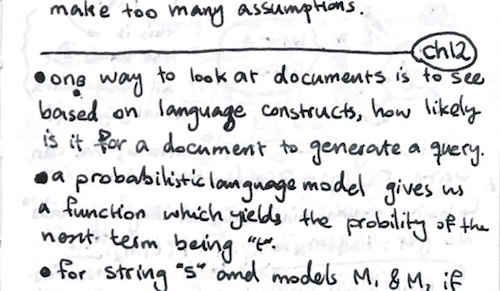 Yes, in the sense that your notes are supposed to capture your understanding of the textbook, so that you will not need to consult it again once you are done. Remember that the purpose of your notes is to increase your efficiency, both in your intake of new material, as well as the speed at which you are able to remember and review the old material. Therefore, the valuable you are storing away isn’t the contents of the textbook. That can be regained by simply reopening the book and locating the particular section of interest. Rather, it is your understanding of what the book says that is paramount. You don’t want to have to re-understand the pages you just read in three weeks. You want to record your understanding in simple phrases, words, shapes, and drawings that unlock your memory of this moment of clarity you have right now, in the future. That is why we take notes: to be able to retain our understanding of a concept, however complex, and access that understanding, strengthen it, and use it at a later time. A few people have pointed out that they use flashcards to prepare for interviews. That is, in my humble opinion, the worst thing you can do to yourself. Flashcards are an absolutely amazing invention and memory device that can be used to train your long-term memory to recognize keys to unlock things from its deepest recesses. They work by first associating a concept with a key question or a set of keywords (or even a picture! ), then committing that to your short-term memory, then elevating that to your mid-term memory, and then, by way of repetition, finally, committing that to your long-term memory. As I have gone on about this at length (and will continue further down), preparing for a technical interview has very little to do with your ability to remember, and much to do with your ability to apply. Therefore, your aim is to understand, not to memorize, and flashcards are the wrong tool for this job. I am not an educational adviser, expert, or official. What I relate here is the result of my years of self-study (at which I do claim to be an expert for my own self), and the only purpose of this article is to serve as a general guideline to help the reader avoid the pitfalls and benefit the shortcuts which I have discovered work for me. This is by no means a catch-all rulebook that is going to make you a great note-taker, rather, it is a set of soft guidelines for hopefully becoming better at what you already do. Most of the time people will start taking notes for subjects they are studying, and at first, it seems like things are going great. Then, they realize that they are a third of the way in reading a 300 page book, and they have already compiled 40 pages of notes. Or they often try to review the subject they have taken notes on, and realize that their notes are lacking crucial bits of information which forces them to reopen the textbook and reread a whole section from scratch. These, among other such frustrations, often act as deterrents for people who haven’t had a great experience taking notes so that they don’t take notes when it is important they do. Therefore, let us look some things you should and you shouldn’t do while taking notes. This list is specially curated for taking notes while studying for a technical interview, but it doesn’t mean that all the points herein are void if you aren’t following that path. Now, let’s talk about some of the things that we can do to make our note-taking experience more pleasant and fruitful. Be consistent: choose a notebook you like, and if necessary, purchase multiple volumes of it, as per your needs. Stick to that notebook. Choose a color (best if it is a bland, yet easily readable color such as black or blue), a pen, and use that throughout. Keep the size of your writing the same. This will let you measure the pace at which you are taking notes and helps you understand the density of chapters. Divide the notes into meaningful sections that follow the textbook. Don’t reorganize the contents of the book. The author(s) and editor(s) have spent (hopefully) a lot of time and energy figuring out what goes where. Avoid making too many decisions: note-taking time is when you are writing down your understanding of a subject. Don’t clot your focus by thinking of things like which pen to use. Number the pages of your notebook. This makes referencing your notes easier, and also gives you a sense of how far you are in the subject. Also, seeing the numbers go up will make you feel better and more accomplished. Don’t introduce unnecessary variations. If you are dividing chapters by a blank page, that is fine. Just don’t suddenly decide to instead use a double-line divider. Make up your mind from the start. The more decisions you make before you dive in, the less you have to think about when you are taking notes. Don’t take notes while reading the material. This is absolutely important. When you are reading the topic first, you really don’t know what is important and what is not. At first glance, everything is new and might be very useful later. But later on, you might realize that some things are not important at all, while there are other implied concepts that are not directly mentioned in the book. Instead, read the text, try to figure out what it is trying to say in your head, verify your understanding by skimming the book, and write down what you learned. Don’t go too far before taking notes. Only go as far as your short-term memory stretches. If you read a whole chapter before taking notes, chances are you are going to forget some of the details. If necessary, reference the original text to avoid writing down entire blocks of text. Don’t be afraid of using short-hands in your notes. They are yours, after all. Only you need to understand them. Don’t take too long summarizing your understanding. If you can’t summarize a concept in about a sentence, chances are you are being too verbose. Don’t wait too long before writing things down. Once you have read a section or so, before giving yourself a break, take notes. If your study time is up and you have to take a break, don’t start your next study session with note-taking. Instead, start by quickly overviewing the things you just studied, and follow that with taking notes on the subject. Don’t write anything more than once. Reference back (or forward) whenever possible. This is where having page numbers is handy. Reference your notes to avoid writing things down more than once. Don’t jump between subjects. While it is true that your notes shouldn’t replace a whole textbook, it shouldn’t be too difficult to map a note page to a textbook page and vice versa. Don’t jump to another subject in your notes, unless you are absolutely done with taking notes on the current subject. 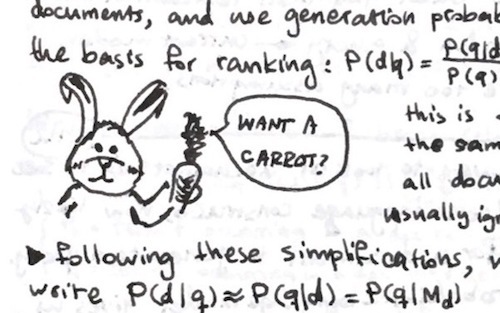 Spice your notes up: don’t be afraid to use humor, cartoons, and anecdotes in your notes. While it is usually difficult to make written technical text engaging for an audience, luckily your text needs to only be engaging to an audience of one: you. If you are just too tired of taking notes, try to think of a nice doodle that goes along with the subject. Add doodles, even if it is just to have pictures to look at. Use other media: don’t just write. You have a pen and a piece of paper. You can draw diagrams, write formulae, use the pen to make text bold and write in italics, or even write with a different orientation. Use shapes, diagrams, and pictures, if they are more concise. Don’t use too many colors. Switching to other colors is going to cost you minutes each day, that can add up to a few crucial hours. Don’t worry, if your notes are too drab, you can always come back and use other colors to spice it up when reviewing your notes. Don’t be careless: you don’t want to end up with lots of text being crossed out and a lot of corrections interjected into your notes. That makes your notes ugly and not interesting to look at, and therefore less engaging. Don’t be a perfectionist. Don’t tear away pages just because you had to cross out a couple sentences. Don’t use a correction pen or marker. It takes too much time. Think of the strokes of pen you had to deliver to correct yourself as dark patches of ink that are the beauty marks of your page. Just don’t overdo it. Be concise: you don’t have to write complete sentences. Just enough that it is legible. You just need to be able to know what the heck you are talking about later on. Use icons and glyphs to draw attention to important parts of the notes you are taking. An atypically difficult to remember technique? Maybe a skull will help. Don’t compile a notebook of bullet points. While bullet points are great in conveying lists of items, they often don’t help you understand the context of the items themselves, and their interrelations. Use indentations to visually compartmentalize parts of the text. Nothing attracts the eye better than an empty patch of paper on an otherwise fully inked down section. Don’t write too tightly. You don’t want to strain your eyes when rereading your notes. Don’t space your notes apart too far. You want to utilize the paper to its utmost, without making it look cramped. Use a pocket-sized notebook that you can carry around and read whenever you have time. Reread your notes regularly. Every few pages go back and read what you have written. Don’t be afraid to correct mistakes you find. Don’t try to memorize your notes. Nobody is going to ask you to implement a red-black tree delete operation from memory. If that is indeed the target of the question, you will be given enough context to understand the important points, and if you have been diligent in your studies, you will be able to apply the techniques you have learned (not memorized!) and solve the problem at hand. I think that list is quite long enough to nudge you in the right direction when it comes to taking notes. I might update this list later (or more probably, publish another, complementary post) if other important tips jump at me. I have reviewed my notes many times. That doesn’t mean that they are error-free. If you see any errors, please point them out to me. Commenting on this post works, opening a GitHub issue works, emailing me, and other venues of contact also work. 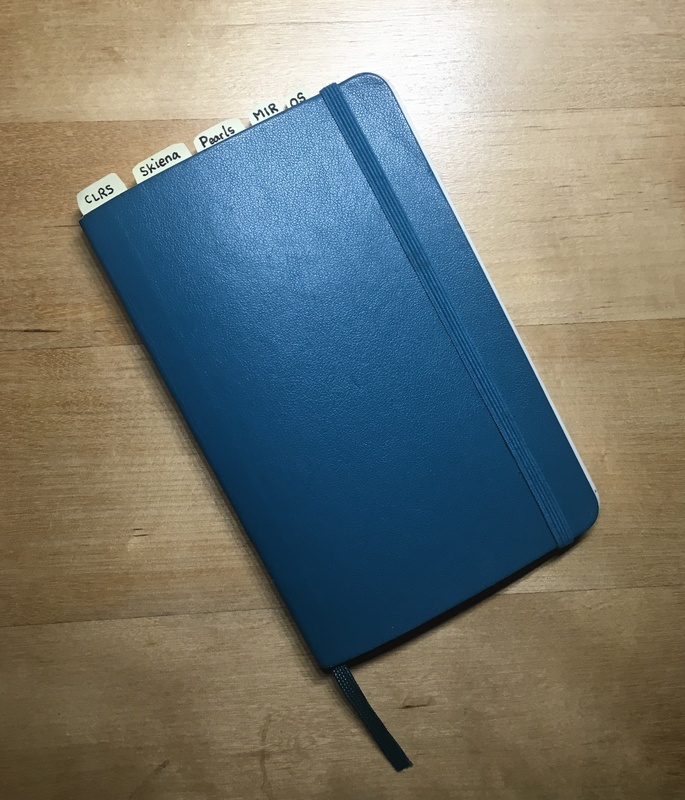 I have taken notes on a 3.5″ (very pocket friendly) Moleskine notebook, soft cover (I like their quality) , plain paper (I like to set the rules myself, rather than follow the lines in the notebook). I was somewhat careless with my notes and stained a part of it with tea. That’s where the smudges come from. I have inter-book references in my notes, which I have usually stylized as “see CLRS(20)”, which means go and check the notes for CLRS, page 20. So, with all those notes out of the way, let’s talk about the actual note. The GitHub repository is organized into folders, one for each book. For more on contributing and feedback, see the README file on the repo. In this article, I have tried to share my experience in taking notes, as well as my own notes on the subjects I have studied. If you have any comments about the notes themselves, about the points I have made here, or just want to chat, drop me a comment or a message. If you find this useful, please share it with your network of friends, colleagues, and other professionals whom you think might benefit from it. Thanks!